“Islam prohibits violence against women”, reads a billboard portraying a young girl. A similar one says: “Real Men Do Not Abuse Women”. Both billboards carry an orange background. This is not by chance. Orange is the colour of the “16 days of activism campaign against Gender Based Violence” UN led international campaign (UNiTE) taking place each year, as of the early 90s. The campaign seeks to raise awareness and galvanise action to end violence against women and girls around the world. It stars on 25th November, the International Day for the Elimination of Violence against Women, and ends on 10th December, Human Rights Day. In the Puntland State of Somalia, the campaign, calling for the prevention and elimination of violence against Somali women and girls, is co-ordinated by the Puntland Ministry of Women Development and Family Affairs. The Puntland’s Ministry of Women (MOWDAFA) is “committed in abolishing Gender Based Violence, and in response appealed the international community’s support. 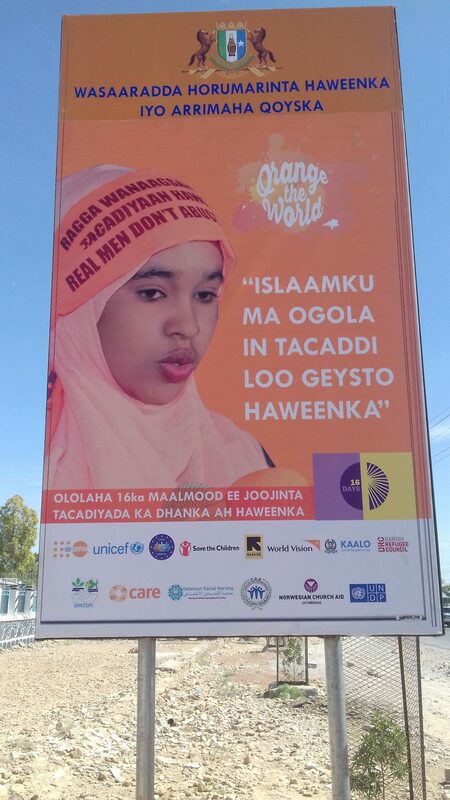 EUCAP Somalia has reply to the call for support by financing the setting up of MOWDAFA’s nine bill boards carrying awareness messages concerning prevention of violence against women and young girls for the nine regions of Puntland.